Leslie George Knight was born on 7 March 1921 in Camberwell, a suburb of Melbourne, Australia. He was the older of the two sons of Harold and Nellie Knight. He had planned to become an accountant, but the war intervened. He joined the RAAF in 1941, and was sent to England in the autumn of that year. After training as a pilot, he formed a full crew while training and, with one exception, they would go on to fly with him throughout the rest of their operational life. The crew was posted to 50 Squadron in September 1942. Knight had flown on some twenty-six operations by March 1943, when the crew were offered the chance to transfer into a new squadron being formed at nearby Scampton for a secret mission. They took a joint decision to transfer together, as his wireless operator, Bob Kellow, later explained: ‘The offer presented to us sounded interesting and with our faith in each member’s ability we made up our minds there and then that we would accept the offer and move over as a crew to this new squadron.’ The crew’s faith was probably because they had together recognised that Knight was an exceptional pilot, even though he couldn’t ride a bicycle or drive a car. On the Dams Raid, Les Knight was flying AJ-N, the ninth and final aircraft of the first wave of Operation Chastise, tasked with attacking the Möhne and Eder Dams. Five mines had been used at the Möhne before it had been breached, which left only three for the Eder, as Bill Astell had crashed en route. David Shannon and Henry Maudslay dropped their mines but did not break the dam, so Knight’s weapon presented the last chance for success. Knight received the DSO for his work on the raid, and navigator Harold Hobday and bomb aimer Edward Johnson both got DFCs. 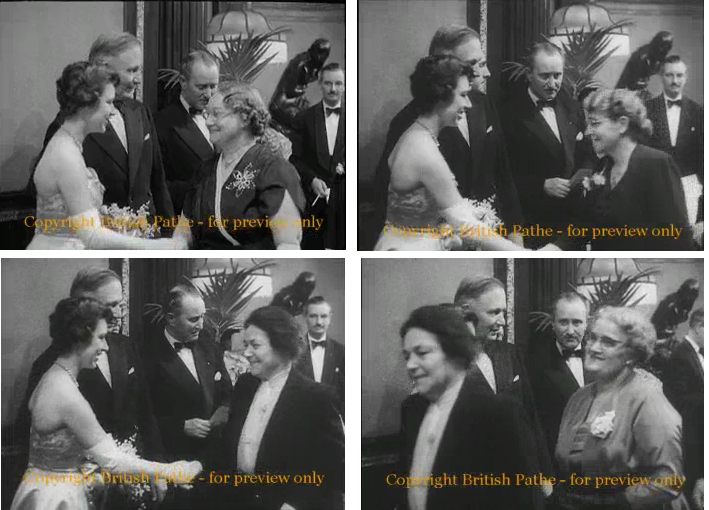 Knight however was an abstemious character and although he appears in the ‘morning after the raid’ photograph taken outside the Scampton Officers Mess he skipped the Hungaria Restaurant party after the London investiture. The crew went back on training after the raid, but the first action they saw was the raid on the Dortmund Ems canal in September. An extra gunner was allocated to each crew, so Knight’s Dams Raid crew was augmented by Sgt L C Woollard. It was a terrible night, with heavy fog blanketing the heavily guarded canal. 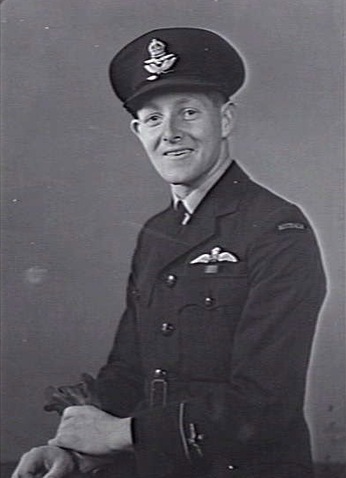 Four of the eight crews who took part had already been shot down when Knight, flying at about 100ft in fog, hit some trees and badly damaged both his port engines. The controls were getting worse all the time until, though he had full opposite rudder and aileron on, Knight could not stop her turning to port and it was obvious that he could never fly her home. He ordered his crew to bale out and held the plane steady while they did. [W]e had crossed the Dutch/German border and were about half way to the Dutch coast. We all knew that at this height and with only one motor working properly our chances of getting back to England were slim. In a few minutes Obie announced that he’d found the cable and was pulling it. ‘I’ll have to stop the starboard inner, Les,’ said Ray, our flight engineer. ‘Try to hold it a bit longer, Ray,’ Les replied. Obie meanwhile warned that his arm was breaking from pulling on the cable and he’d need a break. ‘OK Obie, but pull on it again as soon as you can,’ said Les. It was clear Les was putting on a superhuman effort to keep our crippled plane on some sort of course, but I knew we couldn’t go on much longer. The plane was down to 1,000 feet and the glide angle was steadily increasing. ‘Send out that we’re bailing [sic] out, Bob,’ Les said to me. I unhooked my morse key and began tapping out the message. I stood by him as he firmly held the wheel and tried to keep ‘Nan’ on a steady course, making it easier for each man to jump out. Like a sea captain, he wanted to be sure everyone was safely off before he abandoned ship. His parachute was clipped onto his harness and he looked searchingly at me, probably wondering why I hadn’t jumped already. Using signs, I asked if he was OK. He nodded his answer and a wry smile puckered his mouth. I bent forward with my head down and tumbled out into the dark Dutch night. 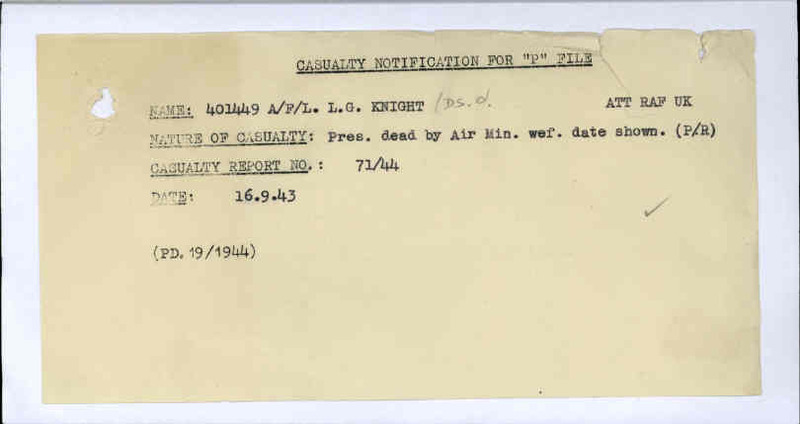 Knight stayed at the controls and attempted a forced landing in a field. He nearly succeeded, but the aircraft hit a bank running across the field and exploded. All seven of the rest of the crew landed safely. Five evaded capture, while two became PoWs. There is no doubt that they all owed their lives to their young pilot, something that they never forgot. At about 3.15am my father woke me telling me that a burning aircraft was flying towards the village. When I looked outside my bedroom window, I saw on the east side of our village a low flying burning aircraft, it was flying towards the village. I remember thinking: this is not going to end well. At that moment, I saw the machine make a slight turn to the right changing his flightpath to a northerly direction. Straight away the aircraft made another course change by turning sharply to the left… I saw the fire at the front of the aircraft had become fiercer. [From the skylight with a view to the north] I saw the aircraft quickly lose height and that the propellors were ablaze. Then the aircraft crashed, and then there was only an intense fire was visible. This happened about 1200 metres from our house. My father went straight to the crash site. My sister and I just followed my father… The heat was terrifying and very intense. It was terrible to see. I was maybe 100, 200m from the crash… My father was there quicker than the Germans. My father saw Knight in the cockpit and he was crouched over. He was leaning forward. He was not sure but it looked as if he was crouched over in the seat trying to cut himself out of the safety harness. My father saw him burning. It was horrible, just horrible. The next morning, the Dutch police and the German military cordoned off the area. Knight’s body was removed from the wreckage and a local schoolmaster called Snel took a risk by taking a photograph as this was done. He later took another of the hearse taking Knight’s body to the cemetery. The body was taken by horse-drawn hearse to the old cemetery in Den Ham by local funeral director Gerrit Meijer, who led the cortège on foot. Dozens of local people (Hammenaren) gathered in the streets and at the entrance to the cemetery to pay their respects, although the Germans prevented them from entering the cemetery. One young boy, Henk Steen, however took a chance and climbed through a hole in the hedge. I stayed very close to the hedge. The German soldiers saw me but did not send me away. I stood maximum ten metres from where everything was taking place. I saw six soldiers march into the graveyard with a German officer and [preacher] Dominee Meuleman. Three soldiers stood on either side of the coffin, Meuleman said some prayers and the officer spoke of course in German. I heard him clearly but did not understand much of what he said. I was told later by someone who could understand German that the officer said that he saw Les Knight as a ‘brother-in-arms and not as an enemy’. The officer then ordered the soldiers to shoot a salvo as military salute. This of course was a very honourable thing to say. For years I have thought about what the officer said and conclude: I believe that officer was a good man. There was no way that a Nazi officer would stay anything as noble as that. Witness quotations from Melvin Chambers, Remembering Dambuster Les Knight, Den Ham, 2018. The grave was first marked with a simple wooden cross, which was replaced after the war with a Commonwealth War Graves Commission gravestone. There is a granite memorial at the crash site itself, maintained by Lucas Kamphuis and others. Further information about Les Knight and the other 132 men who flew on the Dams Raid can be found in my book The Complete Dambusters, published by History Press in 2018.